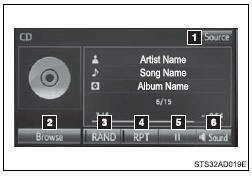 Insert disc or select “CD” on the “Select Audio Source” screen to begin listening to a CD. As the multimedia system is compatible with multi session discs, it is possible to play discs that contain MP3, WMA and AAC files. However, only the first session can be played. • To play MP3 files with steady sound quality, we recommend a fixed bit rate of at least 128 kbps and a sampling frequency of 44.1 kHz. • CD-R or CD-RW playback may not be possible in some instances, depending on the characteristics of the disc. • There is a wide variety of freeware and other encoding software for MP3, WMA and AAC files on the market, and depending on the status of the encoding and the file format, poor sound quality or noise at the start of playback may result. In some cases, playback may not be possible at all. • When files other than MP3, WMA or AAC files are recorded on a disc, it may take more time to recognize the disc and in some cases, playback may not be possible at all. • Microsoft, Windows, and Windows Media are the registered trademarks of Microsoft Corporation in the U.S.A. and other countries. • This system can playback AAC files encorded by iTunes. ●Discs that have a diameter that is not 4.7 in. (12 cm). ●Discs with a transparent or translucent recording area. 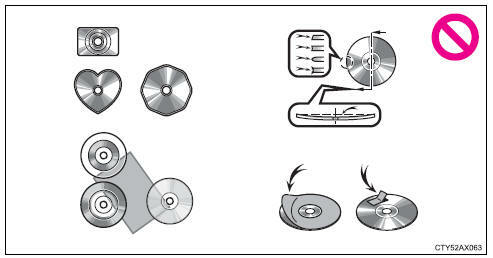 ●Discs that have tape, stickers or CD-R labels attached to them, or that have had the label peeled off. 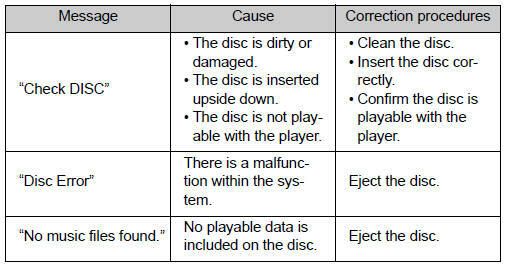 ●Do not insert anything other than discs into the disc slot. ●Do not apply oil to the player. ●Store discs away from direct sunlight. ●Never try to disassemble any part of the player.